Short cycling is when your air conditioner turns itself on and off every couple of minutes, instead of going through an entire cooling cycle the way it should. This prevents your air conditioner from properly cooling your home, but it also increases the strain the system is put under while it’s running. The longer the air conditioner is allowed to short cycle, the more prone to developing issues it’s going to become. This may cause it to fail entirely years earlier than it should. Make sure that you call for repairs as soon as you notice your system doing this. Inside the air conditioner is a part called the air handler, which is designed to circulate air throughout the home while the air conditioner is operating. Inside the air handler motor are a number of oiled air handler bearings, designed to reduce the friction on the motor. The bearings in the motor wear down over time, causing the friction on the system to increase. 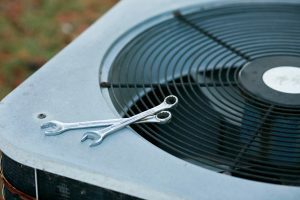 If you hear a loud grinding sound coming from your air conditioner, you should contact a professional as soon as possible. The bearings in the system probably need to be replaced before they fail. If that doesn’t happen, you could end up having the air handler motor burn out. Replacing the motor will be much more expensive than replacing the bearings in it. Gurgling or bubbling noises coming from the air conditioner indicate that there are probably air bubbles in the refrigerant line. That means you have a refrigerant leak. Refrigerant leaks are a serious threat to your air conditioner, as the system relies on the same level of refrigerant throughout its life. The output level of the air conditioner will drop along with the level of refrigerant in the system. Eventually, the system will break down when the refrigerant level inside it drops low enough. Make sure that you have the issue repaired before that happens. Remember that the best thing to do if you suspect your air conditioner is in trouble is to call a professional. If any noises cause you to suspect an issue with your air conditioner, call for repairs as soon as you can even if they aren’t on this list. Evans Plumbing Inc. offers a full range of air conditioning repair services. If you’re looking for the best HVAC contractor in Twin Falls, ID, contact us today to schedule an appointment.